Ukrainian Catholics have a surprising new leader. In February, the head of the Ukrainian Greek Catholic Church, Cardinal Lubomyr Husar, retired for health reasons. 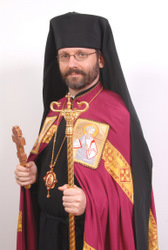 Its bishops convened a synod last week and, after a four-day 'conclave', elected Archbishop Sviatoslav Shevchuk as their new leader. He becomes the Major-Archbishop of Kyiv-Halych, the archiepiscopal see where the Ukrainian Greek Catholic leadership resides. Closely following Pope Benedict's confirmation on Friday, Archbishop Shevchuk was enthroned in Kiev on Sunday. At 41, he is the world’s third youngest bishop, yet he now leads one of the largest churches in the world -- among rites in communion with the Pope, second only to the Latin-rite Catholic Church.